By the standards of recent decades, the economic environment at the time of this symposium one year ago was quite challenging. A year after the onset of the current crisis in August 2007, financial markets remained stressed, the economy was slowing, and inflation–driven by a global commodity boom–had risen significantly. What we could not fully appreciate when we last gathered here was that the economic and policy environment was about to become vastly more difficult. In the weeks that followed, several systemically critical financial institutions would either fail or come close to failure, activity in some key financial markets would virtually cease, and the global economy would enter a deep recession. My remarks this morning will focus on the extraordinary financial and economic events of the past year, as well as on the policy responses both in the United States and abroad. One very clear lesson of the past year–no surprise, of course, to any student of economic history, but worth noting nonetheless–is that a full-blown financial crisis can exact an enormous toll in both human and economic terms. A second lesson–once again, familiar to economic historians–is that financial disruptions do not respect borders. The crisis has been global, with no major country having been immune. History is full of examples in which the policy responses to financial crises have been slow and inadequate, often resulting ultimately in greater economic damage and increased fiscal costs. In this episode, by contrast, policymakers in the United States and around the globe responded with speed and force to arrest a rapidly deteriorating and dangerous situation. Looking forward, we must urgently address structural weaknesses in the financial system, in particular in the regulatory framework, to ensure that the enormous costs of the past two years will not be borne again. When we met last year, financial markets and the economy were continuing to suffer the effects of the ongoing crisis. We know now that the National Bureau of Economic Research has determined December 2007 as the beginning of the recession. The U.S. unemployment rate had risen to 5-3/4 percent by July, about 1 percentage point above its level at the beginning of the crisis, and household spending was weakening. Ongoing declines in residential construction and house prices and rising mortgage defaults and foreclosures continued to weigh on the U.S. economy, and forecasts of prospective credit losses at financial institutions both here and abroad continued to increase. Indeed, one of the nation’s largest thrift institutions, IndyMac, had recently collapsed under the weight of distressed mortgages, and investors continued to harbor doubts about the condition of the government-sponsored enterprises (GSEs) Fannie Mae and Freddie Mac, despite the approval by the Congress of open-ended support for the two firms. Notwithstanding these significant concerns, however, there was little to suggest that market participants saw the financial situation as about to take a sharp turn for the worse. For example, although indicators of default risk such as interest rate spreads and quotes on credit default swaps remained well above historical norms, most such measures had declined from earlier peaks, in some cases by substantial amounts. And in early September, when the target for the federal funds rate was 2 percent, investors appeared to see little chance that the federal funds rate would be below 1-3/4 percent six months later. That is, as of this time last year, market participants evidently believed it improbable that significant additional monetary policy stimulus would be needed in the United States. Nevertheless, shortly after our last convocation, the financial crisis intensified dramatically. Despite the steps that had been taken to support Fannie Mae and Freddie Mac, their condition continued to worsen. In early September, the companies’ regulator placed both into conservatorship, and the Treasury used its recently enacted authority to provide the firms with massive financial support. Shortly thereafter, several additional large U.S. financial firms also came under heavy pressure from creditors, counterparties, and customers. The Federal Reserve has consistently maintained the view that the disorderly failure of one or more systemically important institutions in the context of a broader financial crisis could have extremely adverse consequences for both the financial system and the economy. We have therefore spared no effort, within our legal authorities and in appropriate cooperation with other agencies, to avert such a failure. The case of the investment bank Lehman Brothers proved exceptionally difficult, however. Concerted government attempts to find a buyer for the company or to develop an industry solution proved unavailing, and the company’s available collateral fell well short of the amount needed to secure a Federal Reserve loan of sufficient size to meet its funding needs. As the Federal Reserve cannot make an unsecured loan, and as the government as a whole lacked appropriate resolution authority or the ability to inject capital, the firm’s failure was, unfortunately, unavoidable. The Federal Reserve and the Treasury were compelled to focus instead on mitigating the fallout from the failure, for example, by taking measures to stabilize the triparty repurchase (repo) market. In contrast, in the case of the insurance company American International Group (AIG), the Federal Reserve judged that the company’s financial and business assets were adequate to secure an $85 billion line of credit, enough to avert its imminent failure. Because AIG was counterparty to many of the world’s largest financial firms, a significant borrower in the commercial paper market and other public debt markets, and a provider of insurance products to tens of millions of customers, its abrupt collapse likely would have intensified the crisis substantially further, at a time when the U.S. authorities had not yet obtained the necessary fiscal resources to deal with a massive systemic event. The failure of Lehman Brothers and the near-failure of AIG were dramatic but hardly isolated events. Many prominent firms struggled to survive as confidence plummeted. The investment bank Merrill Lynch, under pressure in the wake of Lehman’s failure, agreed to be acquired by Bank of America; the major thrift institution Washington Mutual was resolved by the Federal Deposit Insurance Corporation (FDIC) in an assisted transaction; and the large commercial bank Wachovia, after experiencing severe liquidity outflows, agreed to be sold. The two largest remaining free-standing investment banks, Morgan Stanley and Goldman Sachs, were stabilized when the Federal Reserve approved, on an emergency basis, their applications to become bank holding companies. The rapidly worsening crisis soon spread beyond financial institutions into the money and capital markets more generally. As a result of losses on Lehman’s commercial paper, a prominent money market mutual fund announced on September 16 that it had “broken the buck”–that is, its net asset value had fallen below $1 per share. Over the subsequent several weeks, investors withdrew more than $400 billion from so-called prime money funds.3 Conditions in short-term funding markets, including the interbank market and the commercial paper market, deteriorated sharply. Equity prices fell precipitously, and credit risk spreads jumped. The crisis also began to affect countries that had thus far escaped its worst effects. Notably, financial markets in emerging market economies were whipsawed as a flight from risk led capital inflows to those countries to swing abruptly to outflows. Authorities in the United States and around the globe moved quickly to respond to this new phase of the crisis, although the details differed according to the character of financial systems. The financial system of the United States gives a much greater role to financial markets and to nonbank financial institutions than is the case in most other nations, which rely primarily on banks.4 Thus, in the United States, a wider variety of policy measures was needed than in some other nations. In the United States, the Federal Reserve established new liquidity facilities with the goal of restoring basic functioning in various critical markets. Notably, on September 19, the Fed announced the creation of a facility aimed at stabilizing money market mutual funds, and the Treasury unveiled a temporary insurance program for those funds. On October 7, the Fed announced the creation of a backstop commercial paper facility, which stood ready to lend against highly rated commercial paper for a term of three months.5 Together, these steps helped stem the massive outflows from the money market mutual funds and stabilize the commercial paper market. During this period, foreign commercial banks were a source of heavy demand for U.S. dollar funding, thereby putting additional strain on global bank funding markets, including U.S. markets, and further squeezing credit availability in the United States. To address this problem, the Federal Reserve expanded the temporary swap lines that had been established earlier with the European Central Bank (ECB) and the Swiss National Bank, and established new temporary swap lines with seven other central banks in September and five more in late October, including four in emerging market economies.6 In further coordinated action, on October 8, the Federal Reserve and five other major central banks simultaneously cut their policy rates by 50 basis points. 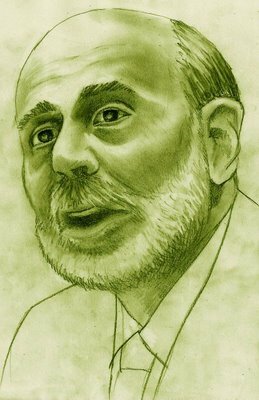 The failure of Lehman Brothers demonstrated that liquidity provision by the Federal Reserve would not be sufficient to stop the crisis; substantial fiscal resources were necessary. On October 3, on the recommendation of the Administration and with the strong support of the Federal Reserve, the Congress approved the creation of the Troubled Asset Relief Program, or TARP, with a maximum authorization of $700 billion to support the stabilization of the U.S. financial system. Although concerted policy actions avoided much worse outcomes, the financial shocks of September and October nevertheless severely damaged the global economy–starkly illustrating the potential effects of financial stress on real economic activity. In the fourth quarter of 2008 and the first quarter of this year, global economic activity recorded its weakest performance in decades. In the United States, real GDP plummeted at nearly a 6 percent average annual pace over those two quarters–an even sharper decline than had occurred in the 1981-82 recession. Economic activity contracted even more precipitously in many foreign economies, with real GDP dropping at double-digit annual rates in some cases. The crisis affected economic activity not only by pushing down asset prices and tightening credit conditions, but also by shattering household and business confidence around the world. In response to these developments, the Federal Reserve expended the remaining ammunition in the traditional arsenal of monetary policy, bringing the federal funds rate down, in steps, to a target range of 0 to 25 basis points by mid-December of last year. It also took several measures to further supplement its traditional arsenal. In particular, on November 25, the Fed announced that it would purchase up to $100 billion of debt issued by the housing-related GSEs and up to $500 billion of agency-guaranteed mortgage-backed securities, programs that were expanded substantially and augmented by a program of purchases of Treasury securities in March.10 The goal of these purchases was to provide additional support to private credit markets, particularly the mortgage market. Also on November 25, the Fed announced the creation of the Term Asset-Backed Securities Loan Facility (TALF). This facility aims to improve the availability and affordability of credit for households and small businesses and to help facilitate the financing and refinancing of commercial real estate properties. The TALF has shown early success in reducing risk spreads and stimulating new securitization activity for assets included in the program. Foreign central banks also cut policy rates to very low levels and implemented unconventional monetary measures. For example, the Bank of Japan began purchasing commercial paper in December and corporate bonds in January. In March, the Bank of England announced that it would purchase government securities, commercial paper, and corporate bonds, and the Swiss National Bank announced that it would purchase corporate bonds and foreign currency. For its part, the ECB injected more than €400 billion of one-year funds in a single auction in late June. In July, the ECB began purchasing covered bonds, which are bonds that are issued by financial institutions and guaranteed by specific asset pools. Actions by central banks augmented large fiscal stimulus packages in the United States, China, and a number of other countries. On February 10, Treasury Secretary Geithner and the heads of the federal banking agencies unveiled the outlines of a new strategy for ensuring that banking institutions could continue to provide credit to households and businesses during the financial crisis. A central component of that strategy was the exercise that came to be known as the bank stress test.11 Under this initiative, the banking regulatory agencies undertook a forward-looking, simultaneous evaluation of the capital positions of 19 of the largest bank holding companies in the United States, with the Treasury committing to provide public capital as needed. The goal of this supervisory assessment was to ensure that the equity capital held by these firms was sufficient–in both quantity and quality–to allow those institutions to withstand a worse-than-expected macroeconomic environment over the subsequent two years and yet remain healthy and capable of lending to creditworthy borrowers. This exercise, unprecedented in scale and scope, was led by the Federal Reserve in cooperation with the Office of the Comptroller of the Currency and the FDIC. Importantly, the agencies’ report made public considerable information on the projected losses and revenues of the 19 firms, allowing private analysts to judge for themselves the credibility of the exercise. Financial market participants responded favorably to the announcement of the results, and many of the tested banks were subsequently able to tap public capital markets. Overall, the policy actions implemented in recent months have helped stabilize a number of key financial markets, both in the United States and abroad. Short-term funding markets are functioning more normally, corporate bond issuance has been strong, and activity in some previously moribund securitization markets has picked up. Stock prices have partially recovered, and U.S. mortgage rates have declined markedly since last fall. Critically, fears of financial collapse have receded substantially. After contracting sharply over the past year, economic activity appears to be leveling out, both in the United States and abroad, and the prospects for a return to growth in the near term appear good. Notwithstanding this noteworthy progress, critical challenges remain: Strains persist in many financial markets across the globe, financial institutions face significant additional losses, and many businesses and households continue to experience considerable difficulty gaining access to credit. Because of these and other factors, the economic recovery is likely to be relatively slow at first, with unemployment declining only gradually from high levels. How should we interpret the extraordinary events of the past year, particularly the sharp intensification of the financial crisis in September and October? Certainly, fundamentals played a critical role in triggering those events. As I noted earlier, the economy was already in recession, and it had weakened further over the summer. The continuing dramatic decline in house prices and rising rates of foreclosure raised serious concerns about the values of mortgage-related assets, and thus about large potential losses at financial institutions. More broadly, investors remained distrustful of virtually all forms of private credit, especially structured credit products and other complex or opaque instruments. At the same time, however, the events of September and October also exhibited some features of a classic panic, of the type described by Bagehot and many others.12 A panic is a generalized run by providers of short-term funding to a set of financial institutions, possibly resulting in the failure of one or more of those institutions. The historically most familiar type of panic, which involves runs on banks by retail depositors, has been made largely obsolete by deposit insurance or guarantees and the associated government supervision of banks.13 But a panic is possible in any situation in which longer-term, illiquid assets are financed by short-term, liquid liabilities, and in which suppliers of short-term funding either lose confidence in the borrower or become worried that other short-term lenders may lose confidence.14,15 Although, in a certain sense, a panic may be collectively irrational, it may be entirely rational at the individual level, as each market participant has a strong incentive to be among the first to the exit. Panics arose in multiple contexts last year. For example, many financial institutions, notably including the independent investment banks, financed a portion of their assets through short-term repo agreements. In repo agreements, the asset being financed serves as collateral for the loan, and the maximum amount of the loan is the current assessed value of the collateral less a haircut. In a crisis, haircuts typically rise as short-term lenders attempt to protect themselves from possible declines in asset prices. But this individually rational behavior can set off a run-like dynamic: As high haircuts make financing portfolios more difficult, some borrowers may have no option but to sell assets into illiquid markets. These forced sales drive down asset prices, increase volatility, and weaken the financial positions of all holders of similar assets, which in turn increases the risks borne by repo lenders and thus the haircuts they demand.16 This unstable dynamic was apparent around the time of the near-failure of Bear Stearns in March 2008, and haircuts rose particularly sharply during the worsening of the crisis in mid-September.17 As we saw last fall, when a vicious funding spiral of this sort is at work, falling asset prices and the collapse of lender confidence may create financial contagion, even between firms without significant counterparty relationships. In such an environment, the line between insolvency and illiquidity may be quite blurry. Panic-like phenomena occurred in other contexts as well. Structured investment vehicles and other asset-backed programs that relied heavily on the commercial paper market began to have difficulty rolling over their short-term funding very early in the crisis, forcing them to look to bank sponsors for liquidity or to sell assets.18 Following the Lehman collapse, panic gripped the money market mutual funds and the commercial paper market, as I have discussed. More generally, during the crisis runs of uninsured creditors have created severe funding problems for a number of financial firms. In some cases, runs by creditors were augmented by other types of “runs”–for example, by prime brokerage customers of investment banks concerned about the funds they held in margin accounts. Overall, the role played by panic helps to explain the remarkably sharp and sudden intensification of the financial crisis last fall, its rapid global spread, and the fact that the abrupt deterioration in financial conditions was largely unforecasted by standard market indicators. The view that the financial crisis had elements of a classic panic, particularly during its most intense phases, has helped to motivate a number of the Federal Reserve’s policy actions.19 Bagehot instructed central banks–the only institutions that have the power to increase the aggregate liquidity in the system–to respond to panics by lending freely against sound collateral.20 Following that advice, from the beginning of the crisis the Fed (like other central banks) has provided large amounts of short-term liquidity to financial institutions. As I have discussed, it also provided backstop liquidity support for money market mutual funds and the commercial paper market and added significant liquidity to the system through purchases of longer-term securities. To be sure, the provision of liquidity alone can by no means solve the problems of credit risk and credit losses; but it can reduce liquidity premiums, help restore the confidence of investors, and thus promote stability. It is noteworthy that the use of Fed liquidity facilities has declined sharply since the beginning of the year–a clear market signal that liquidity pressures are easing and market conditions are normalizing. What does this perspective on the crisis imply for future policies and regulatory reforms? We have seen during the past two years that the complex interrelationships among credit, market, and funding risks of key players in financial markets can have far-reaching implications, particularly during a general crisis of confidence. In particular, the experience has underscored that liquidity risk management is as essential as capital adequacy and credit and market risk management, particularly during times of intense financial stress. Both the Basel Committee on Banking Supervision and the U.S. bank regulatory agencies have recently issued guidelines for strengthening liquidity risk management at financial institutions. Among other objectives, liquidity guidelines must take into account the risks that inadequate liquidity planning by major financial firms pose for the broader financial system, and they must ensure that these firms do not become excessively reliant on liquidity support from the central bank. But liquidity risk management at the level of the firm, no matter how carefully done, can never fully protect against systemic events. In a sufficiently severe panic, funding problems will almost certainly arise and are likely to spread in unexpected ways. Only central banks are well positioned to offset the ensuing sharp decline in liquidity and credit provision by the private sector. They must be prepared to do so. The role of liquidity in systemic events provides yet another reason why, in the future, a more systemwide or macroprudential approach to regulation is needed.21 The hallmark of a macroprudential approach is its emphasis on the interdependencies among firms and markets that have the potential to undermine the stability of the financial system, including the linkages that arise through short-term funding markets and other counterparty relationships, such as over-the-counter derivatives contracts. A comprehensive regulatory approach must examine those interdependencies as well as the financial conditions of individual firms in isolation. Since we last met here, the world has been through the most severe financial crisis since the Great Depression. The crisis in turn sparked a deep global recession, from which we are only now beginning to emerge. As severe as the economic impact has been, however, the outcome could have been decidedly worse. Unlike in the 1930s, when policy was largely passive and political divisions made international economic and financial cooperation difficult, during the past year monetary, fiscal, and financial policies around the world have been aggressive and complementary. Without these speedy and forceful actions, last October’s panic would likely have continued to intensify, more major financial firms would have failed, and the entire global financial system would have been at serious risk. We cannot know for sure what the economic effects of these events would have been, but what we know about the effects of financial crises suggests that the resulting global downturn could have been extraordinarily deep and protracted. Although we have avoided the worst, difficult challenges still lie ahead. We must work together to build on the gains already made to secure a sustained economic recovery, as well as to build a new financial regulatory framework that will reflect the lessons of this crisis and prevent a recurrence of the events of the past two years. I hope and expect that, when we meet here a year from now, we will be able to claim substantial progress toward both those objectives. Tagged banking system, bernanke, crisis, federal reserve, history, macroeconomics, monetary, policy, regulation, speech. Bookmark the permalink.